Here are some of the stocks that I am watching for tomorrow (7/24/17). Thank you very much to this millionaire trader for bringing these to my attention via his free email list updates. If you want to try some other very useful stock trading resources, check out my recommendations page. $DCTH is forming a nice symmetrical triangle on the daily chart. I generally don’t trade stocks this low in price, so I probably won’t take a position. 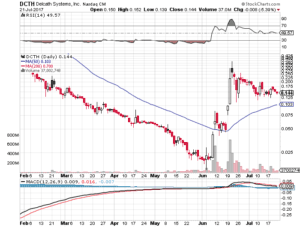 Still it could be a nice continuation chart for those that like these penny stocks. I would be a little nervous about buying in this far above the 50 MA though – a pull back to this line might occur – which is a 33% pull back in price! Keeping on watch for the time being! 2. 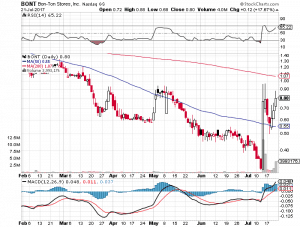 $BONT – Pretty nice trade potential! This could be on a dollar roll to $1 per share. Fibonacci Retracement trade – Possible swing trade for a couple of days to see if this can run to $1 and above. 3. 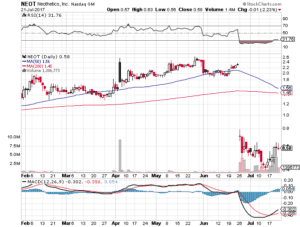 $NEOT – Huge upside potential into the gap if this gets any good news. Very limited downside so fairly nice risk/reward potential. Hopefully, these charts give you some ideas for the coming trading week and good luck ! P.S. Try this FREE Swing Trading DVD that normally sells for $1000 ! Limited time offer.